Image caption The size of the monkey's femur bone (far right) suggested it had "stout legs"
Scientists have examined fossilised remains of a tiny, extinct monkey that were retrieved from an underwater cave in the Dominican Republic. The researchers believe the fossil to be around 3,000 years old, but say the species itself could be very ancient. This reveals clues about the origin of primates in the region. It also suggests that many ecologically valuable treasures could be discovered by the unusual field of "underwater palaeontology". Dr Alfred Rosenberger from Brooklyn College in New York, US, led the examination of the creature's bones, the results of which were published in the Royal Society journal Proceedings B. 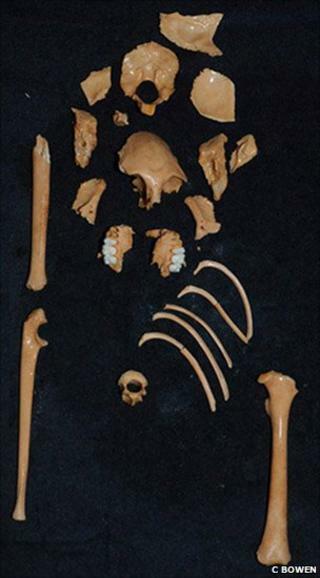 He explained that the bones, which included a skull that was almost complete, were found by a team of scuba divers who were exploring an underwater cave in the area. "It's miraculous that they even saw it," he told BBC News. "When they discovered it, they were fearful the bones were exposed, so they moved the material to a little nook to protect it." Having sought official permission to remove the fossil from the cave, Dr Rosenberger returned to with the scuba divers to retrieve it in October of last year. The divers packed the skeleton into tupperware boxes in order to bring it safely to the surface. Dr Rosenberger said the monkey - only the second specimen of the species Antillothrix bernensis ever found - probably measured about 30cm (12in) from head to toe. But the shape of the legs came as a surprise. "Its femur or thigh bone was very thick. So it had sort of stout legs, which is something we didn't expect. "We don't really have any living examples of New World monkeys that have stout legs like that." Dr Rosenberger thinks the creature went extinct relatively recently. He said that it may have behaved similarly to a koala - clinging to the trunks of trees, rather than leaping from branch to branch. "That's a very rough analogy, he said. "But there's something very interesting about the ecological niche it inhabited." The fossil also adds to evidence that there were several lineages of primates in the Caribbean, instead of one ancestor that moved into the region millions of years ago from which all modern species evolved. Dr Rosenberger said it was likely that several species travelled "over the water" to inhabit the island of Hispaniola. "And even though these particular bones might be relatively young, we're pretty sure that the arrival of these animals occurred well over 10 million years ago. "That's an exciting part of the story - if you compare the dental remains of our monkey to other fossils that we know of, we see strong similarities with Patagonian fossils that are around 15 million years old." Dr Sam Turvey, a researcher from the Zoological Society of London in the UK, said the discovery emphasised how much we still had to learn about the "original mammal fauna" of the Caribbean. "It's now possible to reconstruct what this mysterious animal looked like and how it evolved," he said. "The Caribbean islands have experienced the world's highest level of mammalian extinction over the past 10,000 years. "With this improved knowledge of a recently extinct species, it might be possible to understand what caused it to disappear from Hispaniola."